The Gideon Thai Foot Massager features unique 3D massaging nodes, amazingly designed to mimic the hands and thumb-like action of a professional masseuse. The Thai Foot Massager simultaneously applies soothing pressure to heels, toes, ankles and bottom of feet; rigorously massaging and releasing all tensions and knots. Provides the perfect natural pain relief for Plantar Fasciitis, Heal Spur Bunions, Arthritis, foot swelling and most other foot aches and pains. Thai Foot massaging is also known to effectively improve blood circulation and regulates blood flow. A daily ten minute foot massage session will provide effective relief for most common foot pains and aches. Features an optional infrared based heat therapy, radiating gentle warmth, for an enhanced soothing of achy feet. Choose from two (2) levels of heat therapy or turn heat completely off. Sit back and enjoy the relaxing foot massage after a hard day of work. 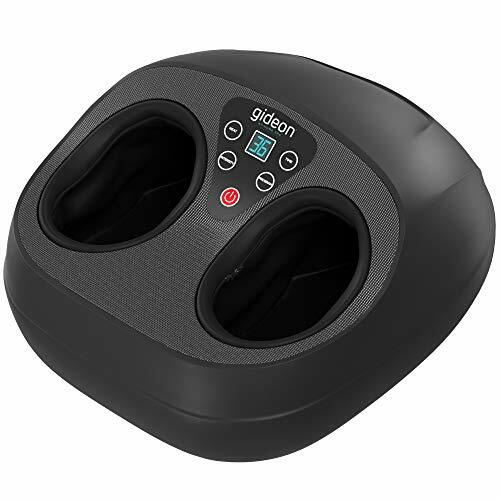 The Gideon Thai Foot Massager features three (3) intensity settings and four (4) massaging programs, allowing for full control on the massaging style and intensity. Set at low for an extremely gentle massaging experience or increase for an amazingly powerful muscle penetration. Treat yourself to a relaxing and soothing foot massage in the comfort of your own home!